the coursework asks for a set of initial questions to be answered and sent to the tutor before proceeding to the Research proposal proper. I received the responses a while ago, then completed A1 for BoW (which covered a fairly similar ground) and am now returning to the research proposal. I think I can understand some of your frustration with linearity and literalness, and hope that you can hold onto your anxiety of being a good student as the linearity of research, practice, and study rarely happen as they are presented. For myself, this is part of my own practice research interest in the Deleuze and Guatarri’s rhizomatic interconnectedness, and also the entangled cut together-apart of new materialism. 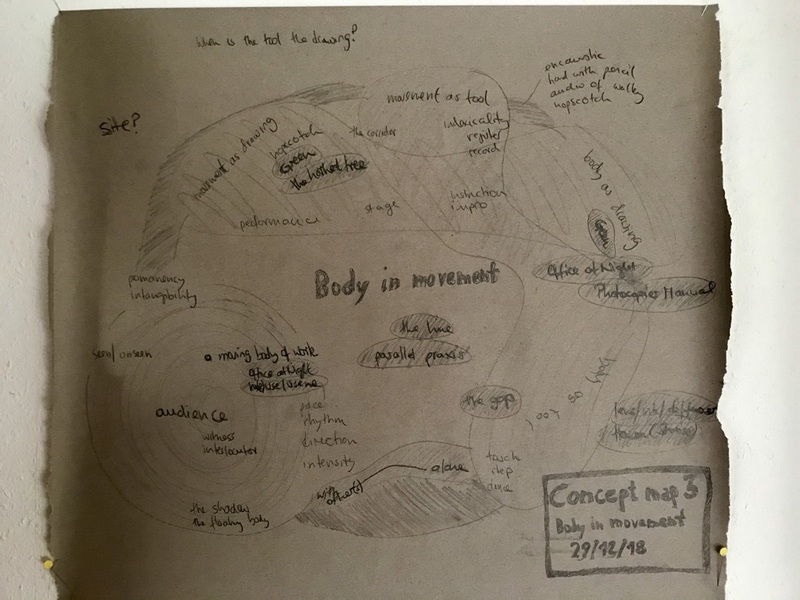 Trust that there will be moments of overlap as well as moments of separateness between the body of work and the research, and that though they will often develop as a hybrid, they will also be separated for clarity of explanation and academic format. I also wonder if the concept maps perhaps seem to relate more to your practice than the research concerns? I imagine if this is the case it is because, as you have identified, at this early stage things seem so closely interwoven? Mapping the theorists and writers as well as their concerns in amongst your own concepts as you start to plan the areas of interest for your written work will help you to keep tightening your approach and focus. 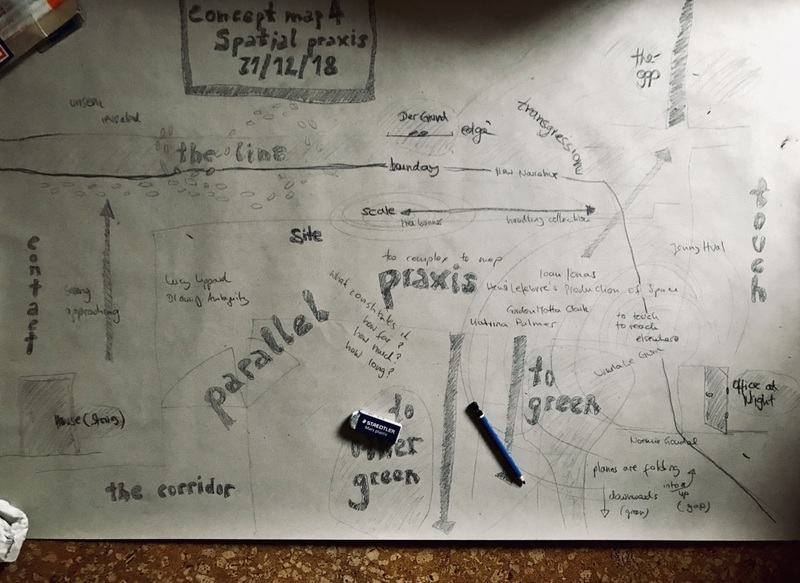 ‘the Research/ dissertation then underpins some of this a research form that can explore conceptual forms, moves and potentiality; I hope that it will concern ideas of production of space/ site; utopian forms of hybridity and how this relates to institutional critique’. I think it will help you to write more about what you understand by these terms, and how you are intending on using some them to clarify your intentions for the research. Also try to use the writers/theorists you have included to help situate your research in more detail. It will also help to start to identify the specific texts you are interested in from the writers you identify in your list of resources. As you move into the next section before assignment 1 you will be able to spend some time honing your research question and what it will entail. This will help you to think about the focused direction of the research and how it will sit in relation to your body of work. Hi Rachel — many thanks for sending this and for providing such thoughtful response. This is really helpful, also in how to differentiate out Research and BoW at this stage. Yes: you are right, the concept maps are largely about the BoW focus (and I assume the Research will then peel off and focus in on one area where theoretical/conceptual support for the BoW is required). Yes, I completely agree re the poor readability of the maps themselves: they are done in graphite on grey paper, are fairly large (60x100cm or so), and I will see if I want to transfer them for a different format.Thank you for picking out that one sentence — and I will spend some time unpacking this (part of it comes down to my geography shorthand; another part also possibly that I am finding a good way to deal with my previous academic work, without it letting drown out the artistic practice). I will spend the time between now and submission of A1 with clarifying/ focussing on some of the writing aspects and what line through the theory/argument I consider as fruitful (while attending to what I may want to keep as options); I am quite good at keeping on to my anxiety and will make a point to get round to Deleuze/Guatarri — my own work was a critical materialism (the left-section of the Frankfurt School, Alfred Schmidt, Horkheimer; then Foucault and Lefebvre), which never valued non-linearity all that much but had a good grasp of overall messiness and how internal relations of dialectics can help us engage with that societal mess. I value that she is doing a PhD and while I haven’t looked at Deleuze/Guattari, they have always been on my list and it will be good to become more involved. there is a real sense of being able to bring in my previous academic work and feed it through the artistic processes without overwhelming them. this is really exciting and something I had hoped to achieve over the past few years (when I re-established an honorary affiliation with my old department in order to pursue precisely this). I have now written up and compiled a series of posts relating to the first questions of Research to be send to my tutor for a first feedback before proceeding to write the project proposal. This has taken longer than planned, part of the reasons for this lie I have written about in this post, here about literalness. Alongside these posts I have a number of further handwritten notes, some of these scanned in here (they include a number of SWOT charts for individual projects, which aren’t written up further yet but I want to do that, as it was a comment during the progression discussion). This is the first set of exercises (from Research, but overlapping with Body of Work) to revisit significant projects, identify a theme of significance, and to begin mapping out a research proposal and workplan. 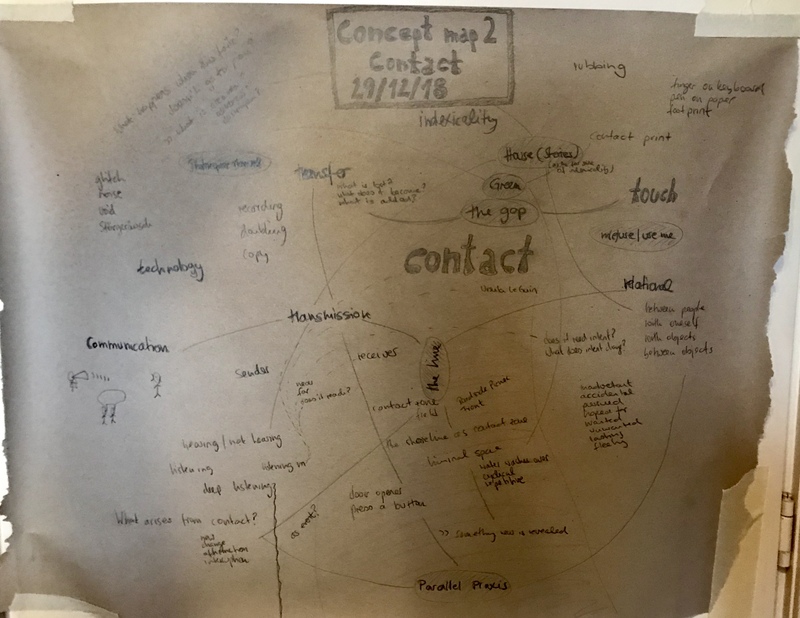 I have done a number of these exercises before arriving at these concept maps, I will see which of them I will add to the blog in what form). These are a mix between concept and mind map. each takes about an hour and i develop these over a few days. i map my previous projects into these. contact and touch overlap in small sections the issue of communication and technology is new to arise and good to see where it fits (Kittler but also of course the spacetimes of Le Guin). 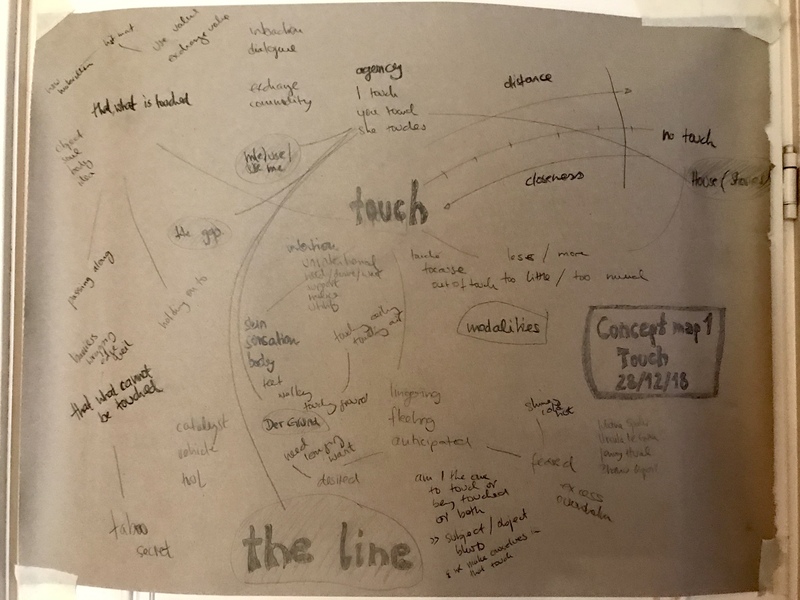 Drawing as contact zone as overall theme for body of work? when is the tool the drawing? what role does the shadow play? what else has been added/ remained/ left in terms of interest? does the focus on interdisciplinarity still hold interest to pursue further? the extended field? what touches and is in contact with whom and what else? what would be a lack/ absence of contact? a gap? Also: what about the confessional/ obsession… do you want to explore it a bit further at this time?